Between July 1 and July 4, representatives from Asia Pacific Alliance for Disaster Management (A-PAD) and Hope Bridge-Korea Disaster Relief Association (KDR), A-PAD’s Korean member organization, visited Yangon City, Myanmar, to take part in the opening ceremony of a new school building at the Damikarama Pyo Oo Yiw Monastery in Bangan Taung Village, Thanlyin Township, Yangon Division. Members of the combined A-PAD – KDR delegation distributed T-shirts contributed by individual donors from Korea who had participated in KDR’s Hope-T Campaign. A-PAD, KDR and the Community Development Association (CDA), the local partner organization in Myanmar, worked together to make possible the completion of the new school building. 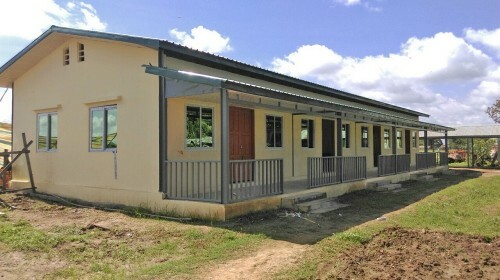 The four classrooms with reinforced concrete structure as well as desks and chairs for about 230 students from grades 1 to 8 replace an old wooden school house where students had to study on the floor in one room. Because the area near the school is prone to natural disasters such as floods and cyclones, the stronger new building will double as a shelter for local residents. The parents of the students are mostly farmers who are too poor to send their children to a government-operated school. 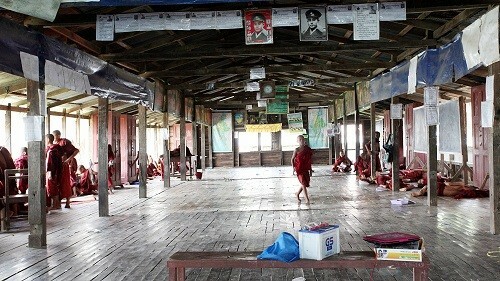 In Myanmar, even though school fees for the primary schools and middle schools run by the Ministry of Education are free, many parents in rural farming areas cannot even afford to provide the most basic school supplies or uniforms for their children to attend the government schools, and instead depend on Buddhist schools such as the one at the Damikaraya Pyo Oo Yiw Monastery for their children’s education. 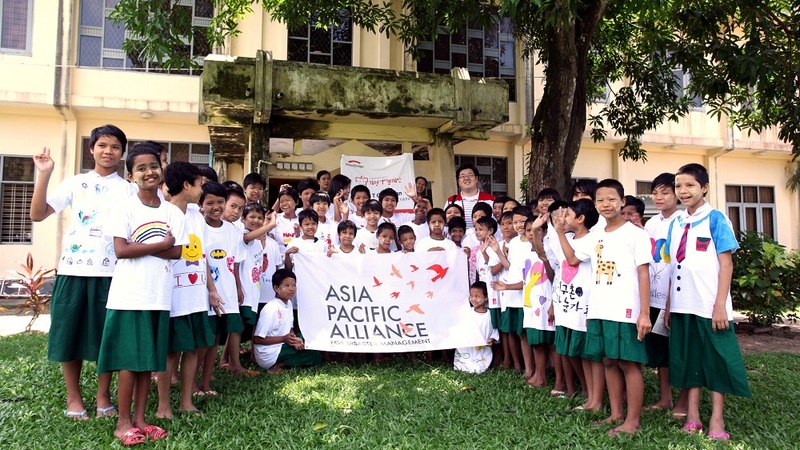 To finance the Myanmar school project KDR provided five million yen raised through its Hope-T Campaign, to which various Korean corporations including Kookmin Bank and Daewon International contributed by purchasing T-shirts kits, so employees could write messages and draw pictures. Thanks to CDA President Dr. Khin Maung Win and the staff who made possible the timely distribution of the donated T-shirts to the children at the Monastery school, the delegation was also able to visit five other special schools and orphanages operated by Myanmar’s Department of Social Welfare, and give away 5,000 T-shirts in total to the children in respective facilities. 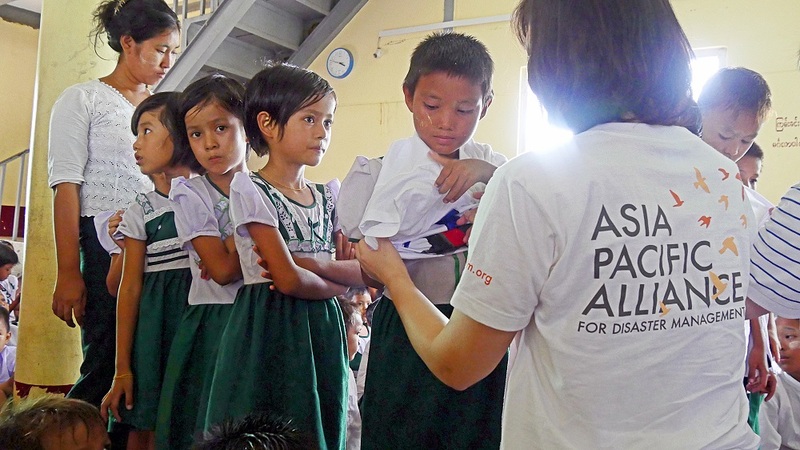 A-PAD and KDR have worked on several overseas community development projects with experienced local NGO organizations as partners. 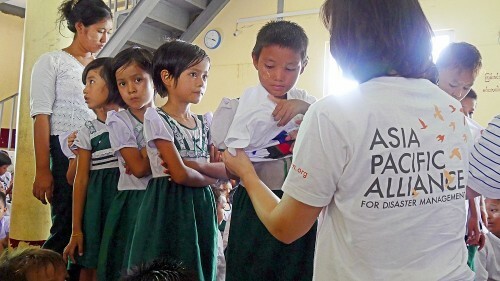 Through such cooperative projects, A-PAD aims at facilitating partnerships among international NGOs and different stakeholders to better prepare for natural disasters in future.